Excerpts of article originally published under the title "Israel Is Going to War in Syria to Fight Iran." JERUSALEM – Israeli officials believe that Iran is winning its bid for dominance in the Middle East, and they are mobilizing to counter the regional realignment that threatens to follow. The focus of Israel's military and diplomatic campaign is Syria. Israeli jets have struck Hezbollah and Syrian regime facilities and convoys dozens of times during Syria's civil war, with the goal of preventing the transfer of weapons systems from Iran to Hezbollah. 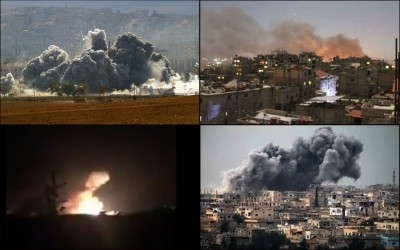 In an apparent broadening of the scope of this air campaign, on Sept. 7 Israeli jets struck a Syrian weapons facility near Masyaf responsible for the production of chemical weapons and the storing of surface-to-surface missiles. The strike came after a round of diplomacy in which Israeli officials concluded that their concerns regarding the developing situation in Syria were not being addressed with sufficient seriousness in either the United States or Russia. A senior delegation led by Mossad chief Yossi Cohen visited Washington in late August, reportedly to express Israel's dissatisfaction with the emerging U.S.-Russian understanding on Syria. Israeli Prime Minister Benjamin Netanyahu visited Russian President Vladimir Putin in Sochi to raise similar concerns with Moscow. Israel is concerned about the free rein Washington & Moscow are affording Iran & its proxies in Syria. In both cases, the Israelis were disappointed with the response. Their overriding concern in Syria is the free rein that all the major players there seem willing to afford Iran and its various proxies in the country. And as long as nobody else addresses that concern in satisfactory, Israel is determined to continue addressing it on its own. Iranian forces now maintain a presence close to or adjoining the Israeli-controlled portion of the Golan Heights and the Quneitra Crossing that separates it from the Syrian-controlled portion of the territory. Israel has throughout the Syrian war noted a desire on the part of the Iranians and their Hezbollah clients to establish this area as a second line of active confrontation against the Jewish state, in addition to south Lebanon. Hezbollah Secretary-General Hassan Nasrallah recently declared "victory" in Syria, with only "scattered" battles remaining. "Syria," of course, hardly exists today. The regime is in the hands of its Iranian and Russian masters, and half of the country remains outside its control. But the Iran-led bloc and its clearly stated intention to eventually destroy Israel certainly do exist, and the de facto buffer against them may be disappearing. Hezbollah Secretary-General Hassan Nasrallah recently declared "victory" in the Syrian war, adding that what remained was "scattered battles." With the prospect of pro-Iranian forces reaching Bukamal on the Syrian-Iraqi border, this opens up the possibility of the much-reported Iranian "land corridor" stretching uninterrupted from Iran itself to a few kilometers from the Israeli-controlled Golan. Earlier this month, Israel shot down an Iranian drone over the Golan Heights. It was the latest evidence of Iran's activities on the border. Syrian opposition reports have noted an Iranian presence in Tal Al-Sha'ar area, Tal Al-Ahmar, and Division 90 headquarters, all in the vicinity of the border. The Iraqi Shiite militia Hezbollah al-Nujaba has declared itself "ready to take action to liberate the Golan." Pro-Iran forces, meanwhile, are open in their ambitions. Hezbollah al-Nujaba, an Iraqi Shiite force supported by Iran, has formed a "Golan Liberation" unit and declared itself "ready to take action to liberate the Golan." Senior figures from the Islamic Revolutionary Guard Corps and the Basij have been photographed in areas close to the border. Israel is concerned by Iran's overarching regional ambitions. 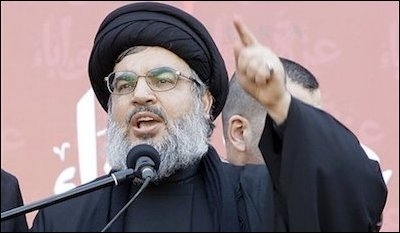 Recent comments by Nasrallah, the Hezbollah leader, that a future war with Israel might involve additional pro-Iranian militia forces to the Lebanese groups have been well noted in Jerusalem. 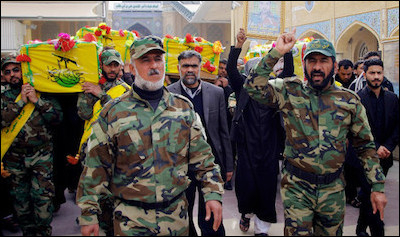 Israeli Intelligence Minister Yisrael Katz recently told a security conference in Herzliya, as reported by Reuters, that in a future war between Israel and Hezbollah the latter may be able to make use of an Iranian naval port, bases for Iran's air and ground forces, and "tens of thousands of Shiite militiamen being brought in from various countries." A recent report in the London-based Al-Quds al-Arabi described Iranian plans to thin out the Sunni Arab population between Damascus and the border with Lebanon, expelling Sunni residents and replacing them with pro-government Shiites from elsewhere in the country or outside it. 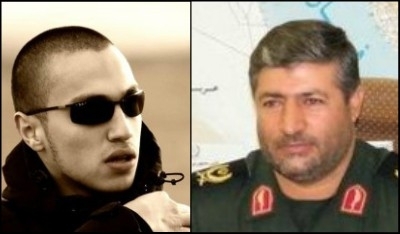 Jihad Mughniyeh (left), son of the late Hezbollah military chief Imad Mughniyeh, and Mohammad Allahdadi, a general in Iran's Islamic Revolutionary Guard Corps (IRGC), were killed in an Israeli targeted strike in January 2015. Israeli strategic culture tends to emphasize addressing immediate threats, but these potential demographic developments are also being watched closely in Jerusalem. From an Israeli point of view, we are back to the pre-2010 Middle East, when Israel and pro-western Sunni powers understood they were in a direct faceoff with the Iranians and their allies. But in 2017, there is the additional complicating factor of a direct Russian physical presence in the Levant, in alliance or at least in cooperation with Israel's enemies. U.S. President Donald Trump's administration, which remains exclusively focused on the war against the Islamic State, has done little to assuage Israeli concerns. The Trump administration has done little to assuage Israeli concerns about the Iranian advance in Syria. Trump and those around him, of course, share the Israeli assessment regarding the challenge of Iranian regional ambitions. The impression, however, is that the administration may well not be sufficiently focused or concerned to actually take measures necessary to halt the Iranian advance — both military and political — in Syria, Iraq, or Lebanon. Where does this leave Israel? First, Israel's diplomatic avenues to the international power brokers in Syria remain open. When it comes to Washington, Israel's task is to locate or induce a more coherent American strategy to counter advance of the Iranians in the Levant. Israel will take the measures it deems necessary to combat the Iranians and their proxies. Its goal when it comes to Moscow is to ensure sufficient leeway from Putin, who has no ideological animus against Israel and no special sympathy for Tehran, so that Israel can take the measures it deems necessary to halt or deter the Iranians and their proxies. Second, Israel will continue to rely on its military defenses, which remain without peer in the region. And as shown in Masyaf, they can be employed to halt and deter provocative actions by the Iran-led bloc where necessary. Nevertheless, as seen from Jerusalem, the shifting regional tectonic plates are producing a new situation in which the Iran-led alliance is once again directly facing Israel, consequently raising the possibility of direct confrontation. Masyaf was not the first shot in the fight between Israel and its proxies in the Levant — and it is unlikely to be the last.